A quota or sales goal is a set number of sales or an overall value of sales that a salesperson is expected to meet over a given period of time. Nearly all companies set quotas for their salespeople because the practice both ensures that a salesperson knows what is expected of him and because it's an easy way to determine what are due to that salesperson. Although quotas are widespread in the sales industry, they take various forms and can vary quite a bit from company to company. A small business with just a handful of salespeople and one or two products will often set a very simple quota system. The goal might be for each salesperson to sell $100,000 worth of products per calendar quarter. A large company with thousands of sales reps and many different products or services to offer might set a very complex quota made up of different targets for different products. A salesperson might be expected to move 100 units of product A, 50 units of service B, and $1,000 worth of add-on services such as warranties. In the case of a large company with offices spread out over a wide geographic area, the goals for each office or location will probably differ based on its perceived potential. In other words, an office that traditionally makes a lot of sales and has lots of market potential will have higher goals for its salespeople than one in an area with fewer potential customers. Quotas can be set for time periods ranging from a week to a year, but quarterly quotas are the most common. A quarterly period gives salespeople plenty of time to align their sales strategies to their goals and set a sales plan into motion. Quarterly quotas can also allow companies to take into consideration. If a particular product sells much better in summer months than in the winter, then the company might have a higher quota in Q3 than in Q4 and make more revenue without putting too much strain on its sales team. Sales executives will usually set quotas based on historical data combined with projections of what they expect their industry will do in the near future. Unfortunately, even the best forecasting models can turn out to be , especially when the marketplace undergoes sudden and unexpected changes. For example, a specific industry might be rocked by a scandal, or new technology might make an existing product obsolete. In either case, the salespeople wouldn't have much of a chance of meeting their quotas because they were set without taking these factors into consideration. Sales managers might want to adjust their commission payouts to relieve some of the sales team's pain, always assuming that they clearly put in their best efforts and failed due to circumstances beyond their control. Commissions are usually in some fashion. Sometimes it's a simple correlation, such as 5 percent for every unit sold under quota and 10 percent after that quota is surpassed. In other cases, companies might set up commissions based on complicated mathematical calculations that factor in the salesperson's performance in selling many different products. 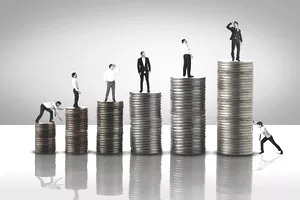 Generally speaking, tying sales commissions to the amount of revenue that a salesperson brings in is a good way to him while keeping that compensation in line with how much money the company made from his efforts. Free calculators abound on the Internet, but if you'd rather create a more personalized quota system or adjust the one you've been using, begin with your goals and existing performance. As a general rule of thumb, many sales experts say a quota is fair if about 80 percent of the salespeople can meet it during most quota periods. If less than 80 percent of the sales team is meeting quota most of the time, this indicates that it might not be realistic and the numbers should be adjusted downward. But if the entire team always meets or exceeds its quota, they might not be challenged enough and you might want to consider increasing the numbers upward. Just keep in mind that doing so without warning or explanation can be demoralizing for your sales force and might not achieve the result you're looking for, particularly if the change is significant. Consider meeting with your sales staff. What are their goals? Consider seasonal lulls that aren't related to sales when you're setting time frames. You can take other things into consideration if your business is on the small side. Do most of your employees take their vacations in the summer months because of the weather, not necessarily because your business experiences a lull at that time? You might want to adjust your quota downward at these times rather than have your salespeople enter the time period already knowing—or at least believing—that they can't possibly meet a quota. It's all about psychology. How likely are they to put forth their best efforts if they go in already feeling doomed? Remember, your quota system does not have to be exactly the same every quarter or every month. You can raise goals or lower them from quota period to the next—just make sure you announce the temporary change loud and clear and explain why you're doing it so no one is surprised by a skimpier-than-expected paycheck. That won't help good will. Another idea is to set specific performance goals with rewards that match their achievement once or twice a year when you know your staff is probably scrambling for cash, such as at the holiday season. Now sit back and monitor your results, making adjustments as necessary.